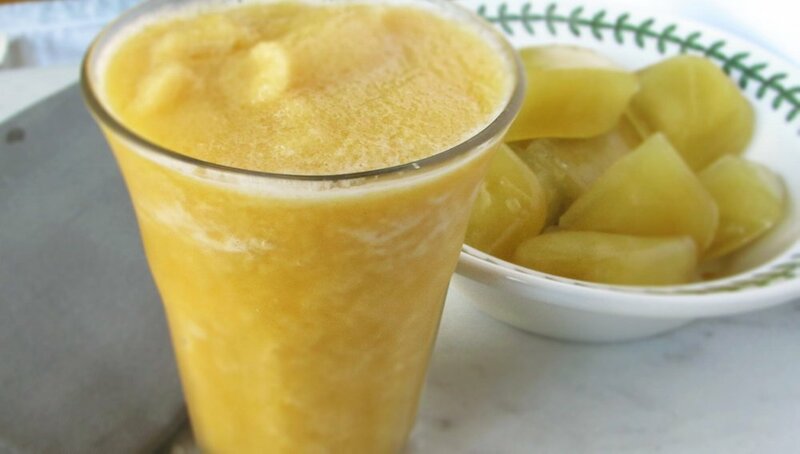 Ginger is very soothing and combining it with green tea and orange juice yields an extremely refreshing beverage! Making ice cubes out of brewed green tea is an easy way to incorporate the health benefits of green tea into a variety of foods. Pop one into ice water for just a hint of green tea flavor or use the ice cubes along with freshly brewed green tea. Enhances mental alertness due to the caffeine content (although it contains much less than black tea or coffee). Improved blood pressure and cholesterol seen in some studies. Ready-to-drink green tea beverages often have added sugar and are much lower in polyphenols and antioxidants than brewed green tea. Unsweetened versions are still refreshing as a beverage though! Heat 2 cups water to a boil, remove from heat and sit for 1 minute. Add green tea bags and steep for 3-5 minutes. Remove tea bags and let liquid cool to room temperature. Pour liquid mixture into an ice cube tray and freeze for 2 hours or until frozen. In a blender combine green tea ice cubes, 1 cup orange juice, 1 tsp minced ginger and honey (if desired). Blend until smooth. Pour into 2 glasses and enjoy!